Normally, it’s Japanese science fiction fans who are watching from afar, wishing the showcase events of their favorite franchises were accessible. But right now, with the help of the Mori Arts Center, that table has been turned. The epicenter of Star Wars coolness is currently Tokyo City View at Roppongi Hills, and fans around the globe are envious. 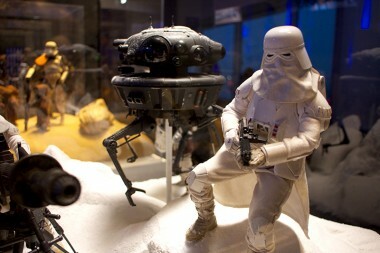 Star Wars Visions opened in the newly-renovated gallery space on April 29 and runs through June 28. Divided into six sections—or visions—the exhibition is a treasure trove for those who love Star Wars and how fantasy worlds and motion pictures are created. Lucas asked 100 artists from around the world to create new work inspired by Star Wars, and paintings by around 60 artists are represented here, hanging alongside a massive assortment of screen-used costumes and props, replicas, models, and more. 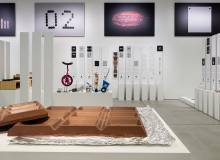 Metropolis recently had a chance to visit the exhibition and was given a guided tour by Yuko Hirata of the Mori Arts Center. From the moment the elevator doors opened to the 52nd floor of Mori Tower, the Force could be felt. Not surprising given that Darth Vader, the Death Star, and an army of Stormtroopers greet you at the entrance. Tokyo City View offers a beautiful setting by day, but the Star Wars Visions experience is best taken in at night, when the genkan darkens for a light show that puts you in the middle of a Stormtrooper firefight. Having survived the barrage of blaster fire, you begin to experience visions—starting with the original ones. Lucas asked artists to portray a realistic “old-style space” setting based on what they remember from seeing the Apollo spaceship covered in soot returning to earth. The result is a very cool, somewhat Asimov-inspired aesthetic. Along with this are displays of the inspirations for Star Wars, including Flash Gordon comics and the background behind Kurosawa’s The Hidden Fortress (1958), which gave Lucas the basic plot for the original film. The next section, Vision of Force, focuses on the two opposing sides of Star Wars: The Light and the Dark. A number of lightsabers are on display, including some that were used for actual filming. Just past the lightsabers is the bust of Yoda that can been seen in the Jedi Temple in the newer trilogy, along with the frightening figures of Darth Maul and the Emperor. Original artwork based on the theme of “Force” can be found here, including Will Wilson’s unsettling Dawn of Maul, an oil on canvas piece that presents the Sith Lord from The Phantom Menace in the ornate style that was common in the Byzantine Empire. Leading into Vision of Battle is a collection of incredibly detailed models built by amateur Japanese model makers. These include ships and land vehicles used by both the Rebels and the Empire. From enormous Star Destroyers with detailed, lighted landing bays to battle-worn X-Wing fighters with fleshed-out cockpits, the artistry is incredible. Opposite these models are lifelike figurines of some of the most popular Star Wars characters—especially various types of Stormtroopers. Created by American designers, these figurines are placed in settings such as the ice fields of Hoth, the deserts of Tatooine, and the forests of Endor. Moving on to Vision of Saga is a treat for those who love costume design and the artistry of bringing unique characters to life. 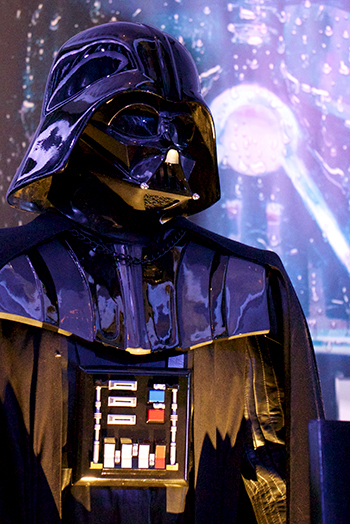 Amongst the many costumes on display are screen-used suits for Stormtroopers and Darth Vader—including his helmet disassembled into three parts. Original paintings show both action—as in Jerome Lagarrigue’s Untitled “Luke Skywalker in Cockpit”—and the Star Wars family tree, such as Princess Leia, an oil on linen work by Daniel E. Greene. The worlds of Star Wars also play a huge role in the storytelling, but are rarely placed in geographic context in the same way as in Star Trek. A giant map of that galaxy far, far away greets visitors as they enter Vision of Galaxy, and provides an amazing perspective on just how vast the Empire is. Beyond that await numerous paintings that capture the essence of worlds like Naboo and Kashyyyk, the home planet of Chewbacca. Finally, Vision of Droid highlights the thread that binds the saga together: C-3PO and R2-D2. These two droids are the only characters to appear in all six films, a fact captured in Christian Waggoner’s acrylic on canvas Worlds Collide. And they’re here in Tokyo as well, as the actual C-3PO and R2-D2 costumes used in the films are on display. 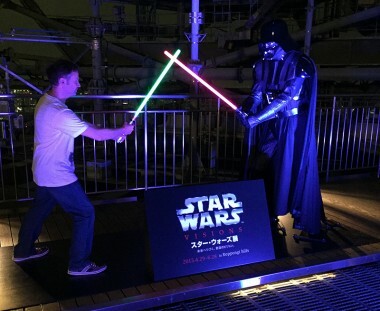 The author meets his destiny and faces off against Darth Vader on the Death Star … I mean Sky Deck atop Mori Tower. As Yoda taught Luke, your journey is not complete until you face Vader. 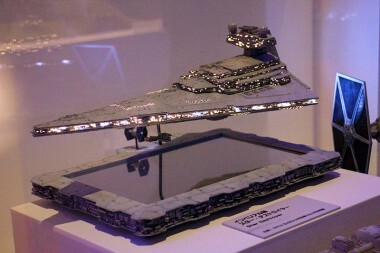 At Star Wars Visions, this means a trip to the roof of Mori Tower (for an additional ¥500). At night, the rooftop observation deck, showered by the driving sounds of the Imperial March, bears more than a passing resemblance to the bowels of the Death Star. Waiting for you at the top of the staircase is Lord Vader himself. Don’t be deceived by his offer of a photo op. The battle is on. Will you be the victor? Star Wars Visions is an absolute must-see for any fan of George Lucas’s saga. And even if you’re a casual fan, but love the art of filmmaking, you’ll find plenty to enjoy here. 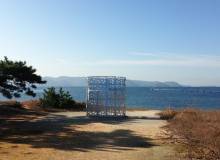 Tickets run ¥1,800 for general admission, ¥1,500 for seniors 65 and over, ¥1,200 for high school and university students, ¥600 for children aged 4 through middle school. Numerous Star Wars items, as well as a commemorative book showing all of the artwork in the exhibition, are available at the gift shop. 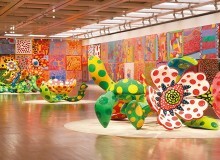 Mori Art Center Tokyo City View. Tel: 03-6406-6652. Open 10am-10pm (doors close at 9:30pm). Nearest Stn: Roppongi. www.roppongihills.com/tcv/jp/sw-visions Star WarsVisions is © and ™ Lucasfilm, Ltd.